In gridiron football, a lineman is a player who specializes in play at the line of scrimmage. 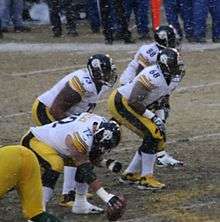 The linemen of the team currently in possession of the ball are the offensive line, while linemen on the opposing team are the defensive line. A number of NFL rules specifically address restrictions and requirements for the offensive line. 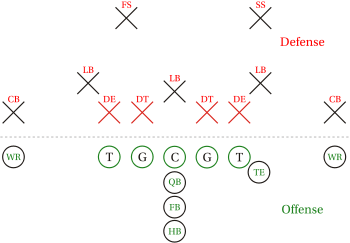 The defensive line is covered by the same rules that apply to all defensive players and the offensive lineman are supposed to help block the quarterback from getting sacks for a loss or even worse a fumble. Linemen are usually the largest players on the field in both height and weight, since their positions usually require less running and more strength than skill positions. An offensive lineman's motion during a play is often limited to just a few quick steps to establish position, followed by a wrestling match similar to sumo. Offensive linemen thus tend to be the largest players on the field, with excellent agility and balance but limited straight-line running speed. Most pro and college football offensive lineman tend to weigh over 300 pounds. Offensive line in three-point stance in white. The interior offensive line consists of the center, who is responsible for snapping the ball into play, two guards who flank the center, and two offensive tackles who flank the guards. In addition to the interior line, a full offensive line may also include a Tight End outside one or both of the tackles. Interior offensive linemen are not eligible to catch forward passes, and are not allowed to advance more than 2 yards past the line of scrimmage at the time a pass is thrown, whether they are engaged with a defensive player or not. However, ends (whether tight ends or wide receivers) are eligible to catch passes. When an offensive lineman knocks a player down on a block, leaving the defensive player lying flat on his back, it is colloquially known as a pancake block. 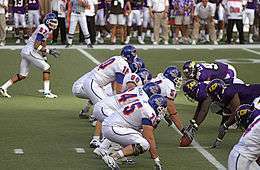 When an offensive line has an equal number of men on either side of the center, it is known as a balanced line. Defensive linemen—particularly defensive ends—are called upon to do more running than offensive linemen, thus they usually tend to be somewhat lighter and faster. ↑ "NFL Beginner's Guide to Football". National Football League. ↑ "What Is a Pancake Block in Football?". Livestrong. ↑ Football. Taylor & Francis.